And another Pulling tractor was sold. 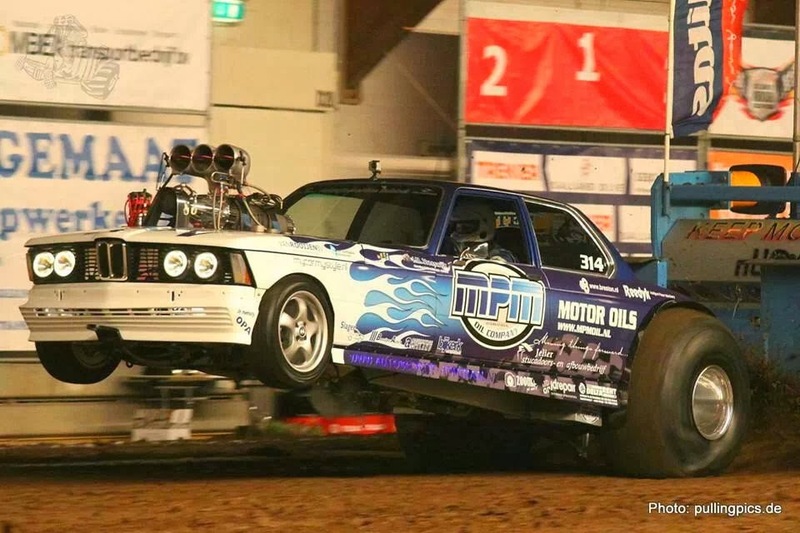 The danish Ford 8430 Pro Stock called ,,Blue Bambino´´ from Nils Damgard was sold to the family Bredahl from Vildbjerg in Denmark. The new team will compete in the danish championships and in the euro cup this year. The new name of the Ford tractor is Bredahl Brothers. For those who want to register as participants for the Füchtorf Hot Farm Pull, check the link. One of the biggest surprises at the NFMS pull yesterday, was the run of Tom Bollinger with his twin Allison V12 modified tractor called ,"Top Gun". The man from Stonington, IL made a very nice pass with a distance of 218.30 feet. In the end the distance was enough for a good 4th place. With this 4th place,Tom Bollinger is qualified for the NFMS finals 2014 on Saturday night. His brother Steve Bollinger finished 8th with his triple Allison called "Money Pit". The distance of Steve´s run was 211.20 feet. That wasn´t enough for the Saturday night finals. The winner in the 7500 ib Modified class, was Ricky Long from Glasgow, KY with his tractor MAV TV. The Tractor is powered by 4 Hemi engines. In runner up position it was Wayne Bunnage from Ellery, IL with Keeps On Tickin and 3rd place wet to Ricky Rose from Glencoe, MN with his Giddy up. Charles City (IA)/Prague, February 11, 2014 – Mitas is taking part in the National Farm Machinery Show (NFMS) with its tractor-pulling team, “Mitas All or Nothing.” Mitas brings the Dutch champion Manon Kools, a successful tractor-pulling competitor who will compete in the 8,000 lb Super Stock Alcohol Tractors category. For Mitas, which opened its radial farm tire factory in Charles City, Iowa, in April 2012, this represents its premiere at the NFMS. 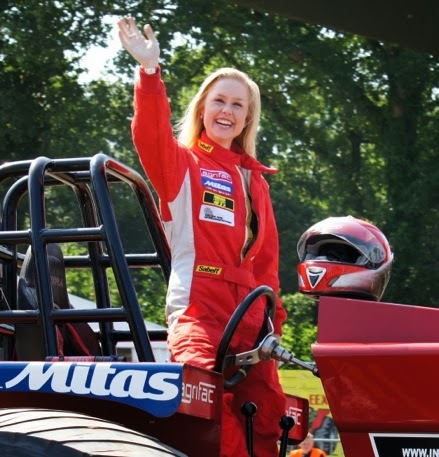 Manon Kools will be present at the Mitas booth #417, located in North Wing, on Wednesday, February 12 and on Friday, February 14, from 2 to 4 p.m. Mitas invites all photojournalists to a photo opportunity with Manon Kools, the Dutch tractor-pulling champ sponsored by Mitas. “We are proud to be a part of the show in Louisville with our Mitas All or Nothing team,” said Andrew Mabin, Mitas’ marketing and sales director. “Mitas is the European leader in combine tires sales having significant market share in tractor tires. With our $52 million investment in the Charles City plant in Iowa, we are now building a strong position on the U.S. market,” Mabin added. For more information please see attached press release. Photo tag: Manon Kools in 2013. Author: Gerrit Budding, 2013. “It has been two years since we cured our first test tire in the new plant in Charles City, Iowa. Now we are manufacturing 42 tire sizes in 51 variations of Mitas- and Cultor-branded tires,” said Neil Rayson, head of sales for Mitas Tires North America. Mitas All or Nothing team driver Manon Kools (20) lives in Zeeland, the Netherlands. At the show in Louisville, she will pull the Case Puma 230. The tractor has 4,000 hp with three chargers and an intercooler. The head is made of aluminium, and there are two spark plugs per cylinder. The tires turn at 75 mph by 6,000 rpm. Dr. Power stage V bijna klaar voor Ahoy. Na een mooie wedstrijd in Zwolle met een derde plaats wordt de TWD nu klaar gemaakt voor Ahoy. Er waren diverse onderdelen in de klepbediening los getrild, dit is reeds gerepareerd. In Ahoy gaan we met onze nieuwe look weer strijden voor het podium. Check de website voor mooie foto`s en filmpjes, like ons op Facebook of volg ons op Twitter. Nog een mooi filmpje hoe het is begonnen uit 2009. Alike last year there will be a Test & Tune event in northern Germany in march. Fair track, Silver level sled, cost (not working hours) shared by all. Last year was fun with a nice little party and a SUPER breakfast buffet. Tractors need to be ETPC registered and have clutch papers. Tech inspectors are on site, but not there to do your "full inspection" for the year. The Dutch John Deere Pro Stock called ,, Mud Patrol´´ was sold (without engine and Puller 2000 tyres) to Germany. The new owner is Christian Tramm from Mölln in Schleswig Holstein. 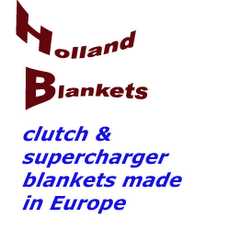 Known is, the team will compete with some changes in the 3.6t Super Sport class in 2014. Hot Head is sold ! The old Hot Head from Ostbevern in Germany is sold. 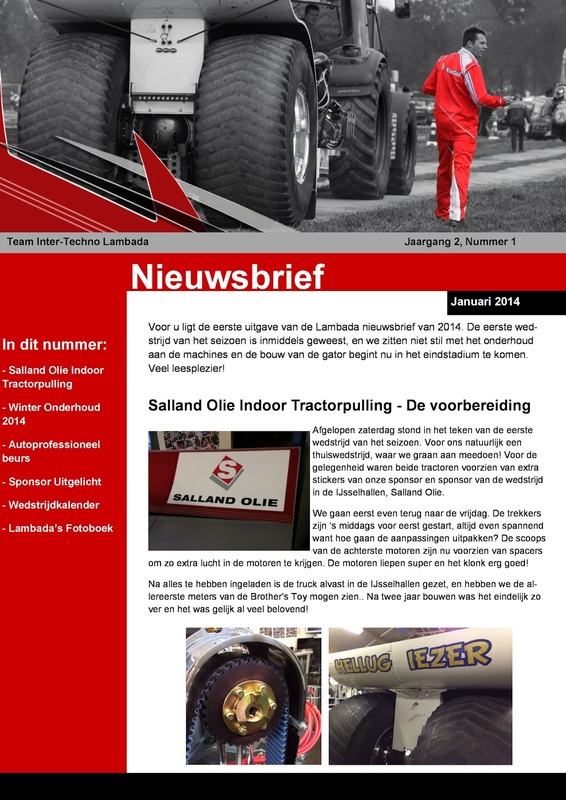 The new owner of the Mini Rod is the Gusenpower Pulling team from Hagenberg in Austria. The first Euro Cup 2014 competitors are known.